Stacking The Shelves is hosted at Tynga’s Reviews and is all about sharing the books we’re adding our shelves–books we’ve bought in physical stores or online, books we’ve borrowed from friends or the library, review books, gifts and ebooks! This week I have five new books to share–two are used book purchases and three are from the library. Ready? Here we go! Never Can Say Goodbye: Writers On Their Unshakable Love For New York edited by Shari Botton I’m an easy mark for a book of pieces by different writers on a common topic, so when I found a “like-new” used copy of this book I snapped it right up. I’ve only visited NY once and while I enjoyed it and would love to go back someday, I can’t ever picture myself living there–so I’m interested to find out why the 27 authors featured in this book can’t picture themselves ever leaving. Our School: The Inspiring Story of Two Teachers, One Big Idea, and the Charter School That Beat the Odds by Joanne Jacobs I may not be a teacher anymore, but I still love reading narrative nonfiction about schools, teachers, and students. This book tells the story of how a particular charter high school was formed in San Jose. The reviews I’ve read say that this is NOT an idealistic, fairy tale account of the process, but rather a realistic view of the successes and challenges that occurred–and that’s a plus for me! Golden State by Stephanie Kegan I’m always intrigued by stories that tackle the theme of how far we’d go to protect the ones we love–and this novel is about a woman who suspects that her brother is involved in a “Unabomber”-type crime at a college campus. The Half Brother By Holly LeCraw This novel takes place over the course of a year at a New England boarding school and involves a love triangle and a long-buried mystery. That’s enough to get me to give it a try! How about you? Have you read any of these? Which books found their way into your home this week? Please share! Categories: Stacking the Shelves | Tags: books, meme, reading | Permalink. Musing Mondays is a weekly meme hosted by A Daily Rhythm that asks you to muse about one of several “bookish” questions… or you can just ramble on about anything you like that pertains to books! You can join in by clicking the graphic above. Go ahead–it’s fun! I love to read, but I’m not independently wealthy—so I depend on borrowing library books pretty regularly to keep up with everything I want to read. Don’t get me wrong—I buy A LOT of books—but there’s just no way that I’d be able to get my hands on all the new releases out there without the help of my local library. I check out eBooks and audiobooks fairly regularly and once in awhile I’ll borrow a DVD—but the main draw for me is the books! Once in awhile I’ll stop at the library on a Saturday morning and I tend to get there right when the family story time session is ending. I absolutely LOVE seeing the little kids pour out of the events room clutching whatever craft they’ve made that day and racing towards the kids’ section! One thing that’s changed about my library habits over the past few years is that I rarely go into the library to just browse anymore. I used to plan on staying a good hour whenever I’d go—I’d usually have a list of specific books I wanted to find, and then I’d wander the shelves and pick out books that just looked interesting. Nowadays I do it all online—I’ll put the books I want on hold, or get on the waiting list for titles that aren’t available, and then I’ll stop by for only as long as it takes to pick them up. And with automated self-check out machines, I rarely interact with any of the librarians. It’s definitely efficient, but sometimes I do miss just wandering the stacks and finding unexpected new books or old favorites. Something I love about my library is their willingness to order just about any book that they don’t currently carry—not just get it through interlibrary loan, but actually order it and add it to their collection. The requestor is then automatically added as #1 on the hold list for the title when it comes in. Plus, if you’re a total book geek like me, you get the thrill of knowing that other people will now have the chance to borrow a book that you recommended! Last week I made these two purchase requests and both were approved, so I’m anxiously waiting for the emails that will let me know that they’ve arrived! I’ve also gotten into the habit of putting myself on a ton of waiting lists. When I hear that a new book is coming out, I automatically check to see it my library has it on order–if they do, I get on that list! My waiting list is usually made up of dozens of titles, but right now there are only ten books on it. The one that I’m most excited about is Harper Lee’s Go Set A Watchman which will be released on July 14–I’m #38 on the list of nearly 200 (so far!). How about you? What’s the library situation like in your area? Do you use your library regularly? Why or why not? Please share! Categories: Musing Mondays | Tags: books, libraries, library, meme, reading | Permalink. FRIDAY FINDS is a weekly meme hosted at A Daily Rhythm–it’s a chance to share the books you ‘found’ and added to your TBR list this week (they don’t necessarily need to be books you purchased)…whether you found them online, in a bookstore, in the library — wherever! Click the icon above to join in! Early Warning by Jane Smiley This is the second book in a trilogy covering the lives of multiple generations of an Iowa farm family in the 20th century. I absolutely LOVED Some Luck, the first book in this series—it was one of the best books I read last year. Smiley uses an innovative technique of telling the story by using each chapter to cover one year in the life of one particular member of the family. As we read, we uncover events that have already happened, but that haven’t been explained . . . we’re left to put together clues based on what other characters say and feel about these events. Some Luck covered 1920-1953, and Early Warning spans 1953-1986—again, with each chapter covering one year from the point of view of a single family member. This latest book was just published on 4/28, and I was thrilled to be #1 on the library hold list! (I may or may not have shrieked a little bit when I got the email notification) I really can’t wait to dig into this novel and I only hope that it measures up to the first book! If you’re looking for books that offer dramatic plot twists and cliffhangers, these probably aren’t for you. But if you like family sagas and character-driven novels offering a taste of real life, please give this trilogy a try! The Bookseller by Cynthia Swanson As a former bookstore employee, how could I resist this title? I had to pick it up, even though the premise is somewhat out of my comfort zone. It’s about a woman who works at a bookstore by day, and at night has fascinating dreams about an alternate life—a life that she once thought she wanted for herself. I’m really not sure what to expect from this book, but I’m willing to give it a try! How about you? Are either of these on your TBR list? What books did you discover this week? Please share! Categories: Friday Finds | Tags: books, meme, reading | Permalink. I adapted a couple of questionnaires I’ve seen recently into the ten bookish questions below. Ready? Here we go—feel free to play along! 1. How long did it take you to finish your last book? Hold on while I check my Goodreads account . . . The last book I read was The Residence: Inside the Private World of the White House. I started it on April 21 and finished it this past Saturday, so that’s five days. By the way—it’s a pretty good book! If you’re into American history and/or the presidency and want a lighter yet interesting read, it’s a good pick. 2. How many times do you stare at your bookshelves each day? Well, I have bookshelves in every room of my house except the bathrooms, so it’s pretty hard to avoid looking at them! I will say that I view my books as comfort objects, so looking at my bookshelves is a very calming experience for me. Plus, I’ve always loved the patterns that the spines of books make on the shelf—kind of like a crazy quilt of books. 3. How many Goodreads friends/books do you have? I joined Goodreads in January 2014 (late to the party—I know!). As of today I have a total of 899 books listed. (Seriously? I can’t get one more on there to get to an even 900?) Here’s the breakdown: 416 books that were read before 2014, 137 read since I joined, 1 currently reading, and 345 on my TBR list. I have 17 Goodreads friends. If you want to compare books, just click on the Reading Challenge link at the upper right! 4. Do you ever quote books in public? I’m sure that I have, but I can’t remember any specific instances. However, I do have this freakish ability to remember very specific lines of dialogue or even short passages from books, and then I will obsess over trying to recall which book these lines are from. I can usually eventually come up with the correct title and then I have this enormous sense of relief! Does anyone else do this??? 5. Do you ever re-read books? I used to be a HUGE re-reader! There are some books I’ve probably read a dozen times. Since I started book blogging I hardly re-read at all because great book recommendations just keep coming from my blogging buddies! I did just re-read To Kill A Mockingbird because I wanted to review it in advance of Harper Lee’s new novel to be released in July—and I’m so glad I made the time to do so! My thoughts about this re-reading are here if you’re interested. 6. Do you judge a book by its cover? I don’t think I’ve ever decided NOT to read a book because of its cover, but covers certainly can prompt me to pick up a book. And speaking of covers, has anyone else noticed the trend over the past year or so of novels featuring a cover shot of a closeup of the back of a woman’s head? What’s up with that? 7. Do you take pictures of your books before you read them? Ummm. . . is this a thing now? I don’t do this. 10. Do you always have a book with you? Silly question–of course! I always have my kindle in my purse and I usually have a physical book with me as well. You never know when you’re going to be stuck in traffic at an extra-long stoplight! How about you? Do we share any of the same answers? Feel free to borrow these questions for your own blog—if you do, leave your link in the comments and I’ll check out your responses! Categories: Musing Mondays | Tags: books, meme, reading | Permalink. I’m trying out a new meme this week–Stacking The Shelves is hosted at Tynga’s Reviews and is all about sharing the books we’re adding our shelves–books we’ve bought in physical stores or online, books we’ve borrowed from friends or the library, review books, gifts and ebooks! 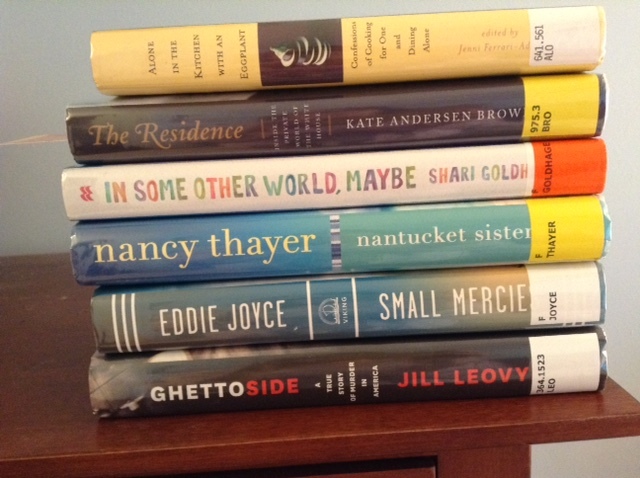 This week I have six new books to share and all are borrowed from the library–no book purchases this week. Ready? Here we go! This is one of those backlist titles that I’ve been meaning to read forever. I love to cook, I love reading about food and cooking, and I usually eat alone—this collection has ME written all over it! I really enjoy behind-the scenes nonfiction, and I’ve also read a lot of books about the Presidency, First Families, etc—so I’ve been looking forward to this new release for quite awhile. I’m about 2/3 of the way through (note the bookmark!) and it’s a good read—just enough gossip to make it interesting but not enough to make it seem tabloidish. This novel covers the lives of three teens who meet at the movies in the early 1990s and whose lives continue to intersect over the next twenty years. It’s billed as a “six degrees of separation” novel and that concept has always intrigued me. Nancy Thayer is one of my automatic authors—I’ll read anything she writes and have loved her books for over 25 years. This novel was released last year and looks like a great read about female friendship. I love novels told through multiple viewpoints, so I’m looking forward to digging into this novel about a family who is still working through their grief over the death of an adult son during 9/11. The story takes place ten years after this loss and spans one week in the life of an Italian Irish American family living on Staten Island. This is a debut novel and I think it’s going to be my next read. This is a new narrative nonfiction work about a “typical” murder investigation in Los Angeles and the larger issues of urban crime. Not exactly light reading, but I’m in the middle of a big nonfiction reading phase right now and I’ve heard good things about this book. How about you? Have you read any of these? Which books did you discover this week? Please share! Categories: Stacking the Shelves | Tags: books, reading | Permalink. Getting Ready For July 14 . . . I don’t re-read books nearly as much as I used to, but I decided to revisit Harper Lee’s To Kill A Mockingbird in preparation for the release of Go Set A Watchman this summer. I remember reading (and enjoying) Mockingbird in my 9th grade English class but didn’t recall much about it except for the broad plot points. I actually remember more about the movie that all of the freshman English classes saw once we finished the book. This was in the pre-DVD and even the pre-VCR days. We watched the movie on an actual reel-to-reel projector and the film broke right before we were FINALLY going to see Boo Radley. I can still remember my teacher racing up the aisle of the auditorium to fix it as about 100 9th graders groaned in frustration! Anyway . . . about a week ago I figured it was time to review so I’d be ready for Harper Lee’s new (old?) novel to be released on July 14–and I was amazed on so many levels. My memory of the book was that it was mostly about the trial of Tom Robinson, with the mysterious Boo Radley showing up every so often. I remembered Scout, Jem, Atticus, and Dill—but no real specifics beyond that. I’m not sure if it’s just because so many years have gone by since my initial reading, or whether much of the greatness of the writing and the depth of the storyline went over my head as a 14-year-old, but I was blown away by how much was packed into this novel. The many plots and subplots (obviously SO MUCH more than a story about a trial! ), the nuances of social class, the aspects of racism that are all too true—and relevant–today, the ebb and flow of small town life, the MANY instances of understated humor . . . plus, I had completely forgotten about the “ham incident”. And I’ve got to admit that I teared up at the end. In retrospect, I’m not really sure that my 9th-grade self was ready to appreciate this book. I’m so glad that the soon to be released Go Set A Watchman gave me the “excuse” to rediscover this American classic. And it makes me wonder . . . how many other books from my past reading lives deserve a second look? How about you? Have you rediscovered any books lately? Are you planning to read Go Set A Watchman? Please share! Categories: Uncategorized | Tags: books, Harper Lee, reading, To Kill A Mockingbird | Permalink. On Hiatus . . . But Still Reading! I’ve been pretty quiet here lately—I haven’t written a post since December 1, and I sure haven’t been visiting and commenting on as many blogs as usual. I’ve been traveling a lot more for my job recently, and that has definitely cut into my regular routine. (The up side is that when you’re sitting in airports, it’s a perfect excuse to read!) So—this post is to say that my blog is going on hiatus for the foreseeable future. I’ll still be visiting your blogs—and hopefully commenting more than I have been recently—and, of course, I’ll still be reading and updating what I’ve read and what I want to read on my Goodreads account. I wish you all a wonderful holiday season, and hope that each of you finds a very special book under the tree! Categories: Uncategorized | Tags: books, reading | Permalink.